For an additional calorie burn, the Gold’s Gym CrossWalk 570 treadmill offers moving workout arms, which should allow you to burn up to 50% more calories by incorporating an upper body workout to your treadmill session. The Gold’s Gym CrossWalk 570 treadmill features the backlit ClearView™ LCD Display readout for time, speed, distance, pulse, incline, and calories burned. UPDATE: The CrossWalk 570 has been discontinued. You can take a look at all of the most popular models for sale here to compare specs and prices. Despite the opinions of some experts who have dogged this machine, the buying public loves it. 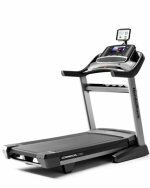 Treadmill reviews of the Gold’s Gym Crosswalk 570 treadmill indicate that owners are satisfied with a ratio of about 10 to 1. The only criticism that comes up often is that many owners say the arms don’t provide enough resistance to do much good for upper body muscle development. If that were the case, you would do better to add a set of 5-lb hand weight to your treadmill time rather than purchasing this machine because of the ski-style arms. Otherwise, this model comes with an amazing number of features for a treadmill priced at just $599. For example, consider that last year the Gold’s Gym machines had 90-day warranties – a decent (for a budget machine) 1-year parts & labor warranty covers the Crosswalk 570. In addition, this machine feels very solid, and has some advanced features usually found on treadmills costing more than $1000: an MP3 plug-in port, heart rate sensors on the handlebars, a workout fan, 2.8 hp motor, and a 10% incline. Those are very good add-ons for a $600 treadmill! We agree with the current owners, the stride handles are a gimmick and are the single biggest issue with this machine, but you can leave them off during assembly. They aren’t worth the effort since they don’t offer much resistance and they must be constantly retightened or they will not stay in the upright position. Other than that – wow. 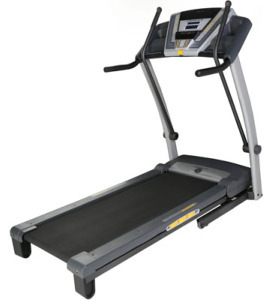 It may be a tad noisy and has some cheap plastic on it, but the Gold’s Gm Crosswalk 570 treadmill is a terrific budget value machine, equal to the Maxx Crosswalk 650, which has been a top economical machine for several years.